RenaissanceRebecca – Page 2 – One woman's quest to pursue everything that interests her. Eight years ago, my parents bought a house in Schroon Lake, New York. It was a former boarding house — ideal when you have five children who like to visit with their friends, significant others, kids. It’s just a block from the lake. A block from the supermarket. A block from the tiny downtown (a coffeeshop, a couple restaurants, a wine bar). All in a quiet town of 1600 souls. The only downside to their purchase? The house was sold to them completely filled with someone else’s stuff. To those of you not wanting to clean out your house in order to downsize and move to Florida, take this lesson from a woman in Schroon Lake: Sell your house. With everything in it. I don’t just mean the house was “furnished.” Oh, no, that would be too easy. Every cabinet, drawer, and closet had stuff in it. The basement? Full of stuff. The plastic storage box on the side of house? Full. With plastic animals you can decorate the lawn with. But wait! There’s more! Every wall was covered with framed prints. Every surface covered with tchotchkes. We’re not talking about coming across some priceless antiques. We weren’t so lucky. They say one man’s junk is another man’s treasure. Well, in this case, one woman’s junk is . . . one woman’s junk. “She moved to Florida,” my mother said. “None of this stuff is really the style you would have in Florida.” Ah, my dear, empathetic mother. And for my father? It was like a treasure hunt. Every time they went up there, I’d get calls about what else they came across. Boxes of Christmas decorations. A closet full of games. Lucky for my parents, Schroon Lake has a town-wide garage sale every Labor Day weekend. People lug their stuff to the park on the lake, display their wares on tables, and hope someone else wants what they no longer do. But for my parents, lugging all this stuff to the park — even though it was only a block away — was hardly going to make a dent. They didn’t have just a table or two worth of stuff. So what is a Gallo to do? Well, in the case of Lou Gallo, you head to your barn in Poughkeepsie, pull out your 20′ x 30′ red and white striped tent, throw it in your Honda Odyssey, drive up to Schroon Lake, put the tent up and your front lawn, and voila. Since their house is on the way to the town park, a few carefully placed signs (and a large red and white tent) made it easy to attract those out that day in search of treasures they didn’t know they needed. Long story short: It took four years of Schroon Lake garage sales for them to clear the house of all the stuff they no longer wanted. I remember one year when more than one person showed up on our front lawn in Schroon Lake and said, “I always look forward to seeing what you guys have each year.” Yes, my parents were now “known” for their garage sales. I wasn’t often able to help Mom and Dad clear out the house, but I was able to be present for a couple of those garage sales. Five tables displayed kitchen wares. Mom hung a string from the front porch post to the tree and draped bedspreads on it, hung curtains from it. Dad leaned some tires up against a tree. “Did you find those in the basement?” I asked him. “No. We brought those from home.” As in their main home in Poughkeepsie. Yes, for these garage sales, my parents imported stuff. I recently heard that most Honda Odyssey’s are now sold to people over 60. Yeah — the one’s who no longer have kids to tote around. They say it’s because the seats are so comfortable for driving. In the case of my parents, it doesn’t hurt that they can also hold a lot of stuff. 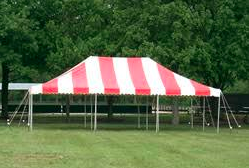 Like the aforementioned tent. And tires. Which brings me to this morning. 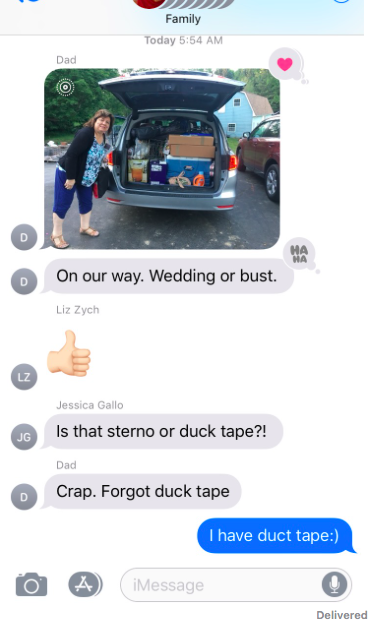 When my parents texted a picture of the back of their Honda Odyssey. That’s my sister Liz giving the thumbs up. That’s my sister Jessica (nicknamed “Eagle Eye” at a young age) asking for further detail. That’s Dad. The man whose every car usually has duct tape in it somewhere, wondering how on earth this one doesn’t. That’s me. Feeling like I just earned 10 points in the favorite child competition because I have duct tape on hand. And that whole “wedding or bust” thing that Dad wrote? That’s my wedding. You know, the one happening in four days. You see, Michael and I are having a BBQ at our house the day after the wedding. Michael was worried about the weather — specifically people roasting under the sun in our backyard. “We’ll have to rent a tent,” he said. “We don’t have to rent one. My dad can just bring one down,” I said casually. “Red and white stripes. Here. I’ll show you a picture,” I said, opening up my laptop, thinking Michael might not want the circus look. “And sun doesn’t come through that?” he asked. And so it is that I called Dad and added the tent to the long list of supplies he’s bringing down for the BBQ. “I’ve got two, ” he said. “I’ll bring both — just in case.” In addition to the chafing dishes, sternos, coolers, and drink dispensers. Lucky for us, despite four years of garages sales, Dad’s still got those. After college, I worked for two months as a physical therapist, then resigned. Crying after work every day wasn’t something I thought good for my mental health. I didn’t leave without a plan, however. I had been visiting a former place of employment, reminiscing about my time there, when I was told they had an opening: a temporary position, but one that would pay me enough to leave my current one. And so it was that I returned to being a seasonal park ranger at Vanderbilt Mansion National Historic Site. After that position ended, I took a three week solo trip to Europe (solo because all my recently-graduated friends only had two week vacations, so couldn’t join me). Then, after a six month temporary position with the US Census Bureau and a one year position with Americorps, I took my first-ever job that didn’t have a definitive end date. And I hated it. So you’re telling me that after a lifetime of having summers off, two weeks off at Christmas, and a week-long Spring Break, I’m expected to spend the rest of my life with two weeks vacation? Maybe four after I’ve worked there a few years? I wasn’t liking this one bit. A therapist told me I had “situational depression.” The “situation” being the job. She also told me I was having a quarter-life crisis. Two twenty-somethings had recently written a book about it, which she told me to read. I did. Then I resigned from my job. And learned that situational depression is cured by changing your situation. I had held that job for a mere eighteen months. That was in 2002, and for the last sixteen years that job has held the record for the longest full-time job I’ve ever had. This wasn’t intentional. But I like traveling. And the only way I could figure on being able to travel as much as I wanted to was to save up some money, then resign and take off. Because no job was going to give me a month off to travel. Plus time to go home for Christmas. Plus a few other days off for my sanity. Now part-time jobs? Those I could hold for a while. I’ve been tutoring math since I was in high school. And what’s funny is that just about when I’d get sick of tutoring a kid, we’d hit Christmas Break. And I’d get my drive back. Until just before Spring Break, at which point I welcomed the week off. And then there was the mad dash to get my students to finish the year on a high note before the blessing that is summer. After which I had the energy to start it all over again. All of this prompted many people to say I should become a teacher. “Oh, no,” I’d explain. “I like working with kids one-on-one. I don’t want to have to deal with a whole class of them.” Well, never say never. This past March marked my nineteenth month as an employee of Carolina Day School. The record has officially been broken. Though part of me wonders: can I really count this as a full-time job? I have nine weeks off every summer. Two weeks (sometimes more) at Christmas. A full week for Thanksgiving. A full week for Spring Break. And all those Monday holidays. Some teachers say, “Yes, but we work so much during the school year, that the hours add up to a full-time job.” Well, maybe for them. I don’t go in early. I leave on time almost every day. And I work a max of three hours on a weekend. I think about my job a lot, though. And talk about it tons. Because I love it. I love the variety. I love the challenge. I love my colleagues and administrators. I love my kids. I could go on, but suffice to say: Yesterday marked twenty years since I graduated from college. It took me twenty years, but I’ve finally found work I love. “What’s your color?” people would ask me. “I don’t have one,” I would say. Apparently, most people choose a color scheme for their wedding. Guests would see this color in the dresses of the bridal party, in the flowers that make up the bouquets, in the centerpieces gracing the tables, and on the invitations. But me? I chose my venue because I walked in and thought, “I don’t have to decorate this place at all and it will still look good.” In other words, who needs centerpieces? I’m also the woman who, the day after I got engaged, bought myself some roses at the supermarket. They lasted so long, I decided I’d buy my wedding flowers there. The morning of the wedding. And my bridal party? I didn’t need them all to match. Because there was only one person in my bridal party: my maid of honor. I told her she could wear whatever she wanted. “So you don’t have a color?” she asked. “Nope.” She just smiled. This is what friends are like. They accept you and all of your oddities. (I have learned in these last four months of wedding planning that not having a “color” was seen as more than just a bit odd). Then my sister Liz called and let me know my nieces (ages 6 ad 9) were wondering if they were going to be in the wedding. “Flower girls, probably,” said my sister. Liz texted me a couple weeks later to let me know that the elder of her two daughters, Ava, announced that she will not be a flower girl. She will be a junior bridesmaid. “Um, okay,” I said. “Is there a difference?” I had to look it up. It seems age is the only qualification for such things: nine to fourteen year olds qualify for this role. “She wants to wear a different dress than (her sister)Bella,” Liz told me. Because we were on the phone, I couldn’t see Liz’s eyes roll, but I knew it was happening. She didn’t say anything for a minute. She finds me baffling sometimes (often?). And I’m guessing she was trying to figure out how to continue this conversation with me. I started to realize that me trying to make everyone’s lives easier by not dictating a color could, perhaps, be making their lives harder: too many options. Lucky for me, a few weeks later, my mother came down and we went to Michael’s to get ideas for flowers. And I loved a little gathering of lavender. “I can just carry this,” I told her. She put it in the midst of some blush colored roses and I said, “That looks nice, too.” So lavender it is. But do you have any idea how many shades there are of lavender? I didn’t either, until I informed Liz of my selection. She went online to order swatches and texted me, “I am ordering swatches in lavender, lilac, wisteria, and Tahiti. The Dusk color is too grayish/brown, right?” I don’t remember what I responded. I might have rolled my eyes. Thankfully, my maid of honor (Dawn) had requested contact info for my sister, Liz. I was overjoyed. Someone else to deal with the minutia of dresses and colors? Go ahead! “Just don’t want the dresses to clash. That would not look good,” Liz texted. “But it would be memorable:)” I responded. “I don’t like the girls to look sloppy,” she wrote. I didn’t get how clashing colors equaled sloppy. I gave up. A few weeks before this, my three sisters, who are not in the wedding, were texting with me about my choice of color. Jessica asked, “Should Meg, Liz, Bethany (my sister-in-law), and I all plan to wear a shade of purple? Or do you want us in pastels?” I know most brides dictate the color for their bridal party. But a bride has to tell her siblings what to wear, too??? I have a hard enough time picking a color for a maid of honor, a junior bridesmaid, and a flower girl. Besides the fact that I am the least fashionable of all my sisters (in-law included), so why they’d want me dictating anything about their clothing was beyond my comprehension. “You could wear red with orange polkadots and I would be fine with that!” I wrote. Jessica responded with an emoticon of a face with a puzzled look on it. Obviously, she didn’t understand my humor. Thankfully, Meg understood. “We are not in the wedding party so why would we have to coordinate?” she wrote. At this point, I was going to have to walk away. I tried humor. I tried patience. So I went rogue and sent a text just to Meg, explaining that we take family pictures at every holiday, and we don’t coordinate our outfits for those! Meg then went behind my back and wrote in the group text, “Becky just informed me we take family pics all the time and don’t match.” Meg included an emoticon of a person laughing so hard they are crying their eyes out. At least someone understood. I will have lavender in my bouquet. My maid of honor will wear lavender, or a color that goes nicely with lavender. My nieces will not clash with my maid of honor. My sisters will wear whatever they want. I’ve always wanted to get married. I’ve never wanted to plan a wedding. But there’s a third party involved here: Dad. AKA The Man Footing The Bill. Let me summarize: we’ve got a hermit, a frugal conversationalist, and a guy who’s been saving for years in order to throw his daughter a big party. Michael has wondered when he will win out over my father. Well, not this time. And so it is that our wedding will be held at a traditional venue. And our invite list includes 190 people. And we’re not only fine with that, we’re happy about it. Because ultimately, who cares? We just want to get married. Who complains about a dad who wants everyone to have a great time? Thankfully, the planning hasn’t been difficult at all. We booked the second venue we looked at. The first officiant we talked to. The second photographer. The first DJ. This doesn’t mean no research has gone into this. But lucky for me, Michael loves that part. Or just realizes if he doesn’t do it, it will never get done. I have zero desire to sort through sixty venues. Michael narrowed it down, showed me his favorites, I picked two, made the appointments, and voila. Mom tried to get me to pick out shoes on her most recent visit, but, at the first store, we were told the summer shoes wouldn’t be out for two more weeks. I didn’t want do go to a second store, so I said, “Meg (my youngest sister) is coming down in a few weeks. Can we stop shopping if I promise I’ll buy shoes when she comes to visit?” Mom gave in. My plan is this: The first day Meg is here, I’ll be working. So I’ll give her my car and the addresses of three shoe places so she can go do reconnaissance. So by the time I’m done with school, we can get this shoe thing finished up in no time. Yesterday we booked our final vendor. And today I looked at the DJ’s questionnaire. “Write Yes, No, or IDK if you don’t know.” I had a lot of IDK’s. There’s one thing I was sure of, however: I want to enjoy the time with my friends and family. So why on earth would I want to spend my cocktail hour away from them taking pictures? Let’s get those pictures done before the ceremony. “So you’re going to do a First Look,” my sister Meg said. I relate this story to a few of my students, one of whom informs me where the “groom doesn’t see the bride before the wedding” thing comes from. “Arranged marriages. They didn’t want the groom to see her, because if he didn’t like what he saw, he might run.” Well, Michael has seen plenty of me. At my best and worst. If he was going to leave, he should have done it by now. So that tradition? Definitely not needed. Somewhere I heard about the book, “Thank and Grow Rich” by Pam Grout. I know all about the gratitude journal craze that’s out there now. I figured it was probably more of the same, but I liked the play on words so decided to get the book from the library. I immediately liked the author’s style and at one point said to myself, “Her name sounds so familiar. . . ” So I looked at what other books she had written and there it was: The 20 Best Vacations to Enrich Your Life. I bought that book in 2008. The first place listed? The John C. Campbell Folk School. I’d never heard of it. I googled it. Was fascinated. Sent away for their catalog, and signed up for my first-ever writing class. Yep. If it wasn’t for Pam Grout, you wouldn’t be reading this blog. Pam has zero interest in 30-day plans. She says it’s quite simple really. To see amazing things happen in your life, just do two things: When your eyes first open each morning, say to yourself, “Something amazingly awesome is going to happen today.” Then, publicly communicate three things you’re grateful for. Text them to a friend. Write them on Facebook. Email them. Whatever. Oh–and they have to be different things every single day. So I decided not to overload Facebook. Or my blog readers. Instead, I’d overload my dear friend and maid-of-honor-to-be, Dawn. I called and asked if I could text her each morning. “You don’t have to write back, or even acknowledge them,” I told her. “I think it would also be a fun way for you to know what’s going on in my life down here,” I said. (Dawn lives in NY, I live in NC.) In no time, Dawn wanted in on the fun. So every morning we text each other at least three things we’re thankful for. I’m grateful for pasta cacio e pepe. I’m grateful for Read/Write (reads my students papers back to them). I’m grateful for Standards Based Grading. I’m grateful for Khan Academy’s online SAT program. I’m grateful for the 5 Walnut Wine Bar, the John Henry’s (the band there last night). I’m grateful for arriving at school in the daylight. I’m grateful for the down jacket that Michael bought me a couple years ago. (“Oh, nice,” said Michael) I’m grateful for my super warm mittens that Carly made. I’m grateful for the two snow days we had a couple weeks ago that gave me lots of time to work on my reports. I’m grateful for my co-teacher in Social Studies who always says things that make me feel like I’m a great teacher! I’m grateful for the ice pack my parents left here once that I use every day in my lunchbox. I’m grateful for Dad leaving cash hidden somewhere ever time he comes to visit. “Okay, okay. I get it,” Michael said. So this week I haven’t felt very stressed at all. And have felt genuinely happy and in a good mood. Not that I don’t usually, but this is more than my usual. Starbucks added $6 to my gift card after I wrote in to them to say I was having some trouble on their web site. When I went to use the card yesterday, there was a station behind the counter set up for what looked like making cake pops. And there were a few ruined ones sitting there. “I guess that means you get to eat them!” I said to the guy behind the counter. “Here,” he said, “Do you want a not-so-perfect cake pop?” I gladly held out my hand. Then, last night, on my way to meet a tutoring student, I stopped in to Whit’s Custard. Michael and I swore off Whit’s Custard for January. But yesterday was February 1st. So I eagerly waited behind a couple while they ordered their custard. Then the cashier said to them, “Anything else?” and the guy said, “Whatever she wants,” and pointed to me! “Sure. Why not. Life is short,” he replied. I usually order a baby scoop, but I quickly decided tonight was a one scoop kind of night. I made some small talk with them, thanked them, and was on my way. Now, would I have gotten all these free sugary treats had I not been starting every morning saying, “Today is going to be an amazingly awesome day”? Maybe. But I’m not taking any chances. A blog I was reading issued a challenge for January: try to eat things you already have in your house. AKA: the pantry challenge. We all have plenty of things in our pantries and freezers we haven’t seen, let alone used, in quite some time. So the challenge says to get that stuff out and use it! I’m pretty frugally minded, so I loved this idea as it meant I’d spend less on groceries and eating out. 12 pounds of dried black beans. Yes. TWELVE pounds. Because Michael was eating a simple meal of black beans, rice, and chicken every day for lunch — but he was buying it from Chipotle. So he decided we could easily make that dish ourselves. And so it was that instead of getting a couple one-pound bags of black beans to try out the idea, he went all in and bought 12 pounds. At the time of my assessment, the bag was unopened. Miso soup mix. I wasn’t sure if it was still good. But it was worth a try. Mushroom Risotto mix. I’m not one for mixes. This was another Michael purchase. I gifted him a survival course for his 49th birthday, and he bought a few of these “just add water” meals at REI for the occasion. This is the last one. He said he had no plans to eat it, so I added it to my list of possibilities. I had some linguine, a half-eaten bag of noodles, and some brown rice pasta. My goal is to switch to all brown rice pastas, mainly so I don’t have to hear Michael complain about how much pasta I eat. So I have to get rid of the linguine and the noodles. Luckily, I had also just bought a hunk of fresh parmesan. (If you’re still eating the Kraft kind in the green cylinder, you don’t know what you’re missing.) This meant I had all the ingredients for one of my favorite pasta dishes: cacio e pepe (cheese and pepper). Our freezer provided some more goodies. Two bags of turkey soup I made after Thanksgiving. A couple bags of turkey meat, which didn’t get closed properly so are probably not good, but I’ll try them. Frozen corn. Green beans. Tilapia (a large bag from Sam’s club — another Michael purchase that I think moved to our new house with us two months ago). And some frozen things our Christmas house sitter left in our freezer. I’ll pay her back next time she’s in town. I started with the black beans. A woman once showed me how to make the real ones (the ones you make with dried beans, not canned), but I didn’t have the ingredients, and honestly I hadn’t made them once since I diligently copied down everything she told me. But Michael and I got an InstantPot for Christmas, so I googled a few recipes and then did a combo of what I found. I sautéed some onions and garlic (in case you don’t know, this is how to get any house to smell like you’re cooking something good), then added a pound of beans (after I sorted out the damaged ones), six cups of water, and a bunch of spices I had. Dried cilantro, coriander, cumin, fresh ground pepper, and a couple other things. I set the pot to cook on high for 20 minutes, then let the steam release for 10, then opened up the pot to find the soupy beans I’d imagined. I cooked off some of the water, and we tried them. Oh how good they were! I’ve made two more pounds since then, but then got a little bored, so didn’t make a batch this week. I’d had the real cacio e pepe in Italy, but I’d never managed to make mine quite like theirs. I knew you were supposed to add pasta water to the sauce, but I always just cooked some pasta then tossed the drained stuff with some cheese and freshly ground pepper. Good, but not quite it. So this time, I decided to follow a recipe. While the pasta was cooking, I melted a little butter and toasted the pepper, then added some pasta water and simmered it. Then, a couple minutes before the pasta was done, I added it to the pan along with some freshly grated parmesan. As instructed, I tossed it all with tongs until the cheese melted and some of the water burned off. MUCH better than previous attempts. I’ve had it a few times since. I still have plenty of black beans. And haven’t had the risotto or miso soup yet. The turkey and tilapia haven’t been touched. So I think I’m going to continue the challenge into February! When my father visits any of my four siblings, there is always something for him to do. Usually some project around the house for which his help or advice is needed. Or a grandchild that wants to play. Or a magazine he can read. Or a television that he can watch. But when he visits me? First of all, up until three months ago, I was his only non-home-owning child. So I didn’t have a running list of projects that Dad could help with. I don’t have grandchildren for Dad to play with. That was never part of my plan. And the only two magazines I subscribe to are Mindful and Cooking Light — neither of which appeal to my father, a man whose typical breakfast is donuts and whose typical lunch is hot dogs. And yes, we have a television, but I don’t think Dad can operate it without assistance. So parental visits to my adopted hometown of Asheville, NC have caused me some stress. Weeks before my parents’ arrival I would start polling co-workers for ideas of what to do with them. On my whiteboard, below the lists of clients and projects, I had a list titled “Parents.” In more recent years I’ve moved that list to my phone. But three months ago, I did something that will make parental visits much less stressful. Or, now that I think about it, maybe just stressful in a different way: Michael and I bought a house. Not a new house–that wouldn’t solve my problem at all as there’d be no projects for Dad. Ours was built in 1986. As was evidenced by the popcorn ceilings and the bar sink on one living room wall. Above which are three shelves tucked into an alcove lined with mirrors. Yeah. I know. You’re jealous. Purchasing a new home was not part of my 2017 plan. Neither was getting engaged. But Michael decided to propose on August 6. And within four days our wedding venue was booked and he was on the phone with a realtor. “So what made you decide to start looking at houses?” she asked Michael. “We just got engaged four days ago and I read in the manual that buying a house is the next thing we’re supposed to do.” Thank God for Michael’s sense of humor. Because mine was dwindling as we drove from one outdated home to the next. Put hardwood floors in the living room, dining room, and kitchen. Put new carpeting in all the bedrooms. Get the crawl space lined, a dehumidifier put in, and some floor joists bolstered. Paint most of the house. “I don’t think you understand,” I told him. “My parents want to help. They love this stuff.” I paused. “Well, I’m not sure they love it. But they do it a lot.” I called Mom to confirm. She laughed. “Yes, I like helping my kids nest.” And Dad? He loves projects. I know relationships require compromise. So despite my strong desire for my parents’ help, I told them we’d need to reschedule their visit. “We’ll keep it in the calendar in case Michael changes his mind,” my dad said. Thankfully, Michael did. I didn’t see much of my dad on that visit. He and Michael were always off working on or getting supplies for some project. I can’t even list them as I don’t recall a single one. All I know is that Mom and I got plenty of bonding time while packing and cooking. Dad still wanted to go out to eat, but Mom and I knew we’d be exhausted at the end of the day, so we took breaks from packing to cook together. Cooking is relaxing to me. For many years I was the only child who lived away from home, so when I returned for holidays I had plenty of time to help Mom cook for our holiday gatherings. Now I only go home for Christmas. “I SO miss you helping me,” my mother tells me. I try to hold back my tears. I miss it, too. Mom and I were right. After the first day, Dad still wanted to go out to eat. We were exhausted. In their impatience, the men ordered pizza, which arrived just about the time the chicken and potatoes finished cooking. We let it cool and packed it away for lunch the next day. Mom and Dad helped us pack, move, and then unpack. “I don’t know how you would have done this without us,” my mother said. I had no plans to do it without them. I did as Michael had asked and attempted to postpone their visit, but deep down I knew they were coming. We didn’t go out to eat the entire time they were here. Unless you count Michael taking Dad to Chipotle for lunch every day. Mom made roast beef. Then stew. Our new neighbors brought over lasagna. “We can go out to eat next time we visit,” Dad said. Yep. And to my list of things to do when my parents visit, I will now be able to add a whole bunch of projects for Dad. Because I hear there are always a few on any homeowners to-do list.